Addax Petroleum, a subsidiary of the Sinopec Group, from China, has been in Gabon since 2004, polluting the river Obangué, and engaged in conflicts over taxes with the Gabon government. Gabon main source of income is petroleum exports. Addax Petroleum, which is a subsidiary of the Sinopec Group, one of the largest oil and gas producers in China and the third largest worldwide oil refiner, has been present in Gabon since 2004. Together with its subcontractors, the company has been exploiting a concession near the Mandji Isle, department of Ndolou in the Ngounié province. In 2010 it was revealed, that the company had been discharging toxic chemical waste into an artificial lake which then feeds directly into the river Obangué. The river is the principal source of freshwater for local inhabitants of the area. A local official from Fouanou, an oil town which is situated a hundred kilometers from Mandji Isle, has testified that local inhabitants have been highly exposed to numerous sicknesses, as they consume the Obangué river's water as well as the fish. Equally, crops as well as animals have been reportedly affected by the pollution caused by Addax. After complaints were made by local authorities, Addax first installed a few public fountains, but did not maintain them when they broke down, leaving villagers with no other option than to continue consuming the polluted river water. According to Marc Ona Essangui, 2009 Goldman Prize recipient, of the local NGO Brainforest, pollution has been going on for almost a decade. Other than pollution coming directly from the oil, there have been reported other sources of pollution such as from sewerage from camp kitchens and toilets that have been dumped in the river, as well as a pipeline leak that took place on December 7, 2009 and gas flaring around the same time. In 2010, after missions to the sites and reports in the newspaper by WWF and local NGOs, the Government of Gabon found Addax Petroleum responsible for polluting the Obangué River, which was considered a great success in the local media, although the affected population has not received any compensation until this day. From 2013 to 2014, Gabon and Addax Petroleum engaged in a legal battle on licence and breaches of contract issues not directly related to the pollution. After having transferred the Obangue Oilfield to to Gabon Oil Company because of failure to pay taxes, Addax was "seeking $330 million dollars in damages from Gabon at the ICC International Court of Arbitration and Gabon responded with a lcaim of $780 million". It resulted in Addax paying $400 million to Gabon to end the oil conflict and continue its presence in the region. Project Details Reuters reported in January 2014, in the midst of the legal battle, that "the asset was small, pumping around 10,000 bpd, but a source close to the company said it was considered strategically important by Beijing as part of its West African portfolio." Addax has paid the goverment of Gabon 400 million USD to continue taking oil, after a dispute on taxes. There are no data on compensation for the oil spill. Abandonment of the oil field by Addax, take over by the Gabon National Oil Company in 2013 and reopening of the operations. 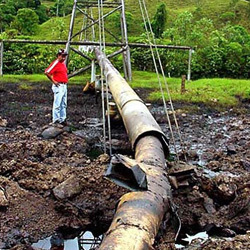 Development of Alternatives Especially the NGO Croissance Saine Environnement has said that the only alternative would be to stop oil exploration in the area. Why? Explain briefly. According to Business and Human Rights and the local NGO Croissance Saine Environnement, it seems that although the government of Gabon has won the case against Addax in court over the pollution incident in 2010, the area is still polluted, has not been cleaned up and affected inhabitants have not been compensated. Addax Petroleum's license for the Obangué oil fields had been temporarily suspended due to a formal legal struggle and the license has been transferred to the national oil company in 2013, but Addax Petroleum is still continuing to operate other oil fields in Gabon and other parts of the region, without suffering any consequences of the pollution caused or having repaired the damages caused.